Our range of outdoor floor tiles are perfect for those who wanting to bring some style to their exterior spaces. Our range of outdoor porcelain and natural stone floor tiles are perfect for those wanting to flow their interiors to their exterior areas such as patios, terraces and balconies, or to simply revamp an existing patio area. All with high levels of slip resistance and in a range of on-trend designs our range of external tiles will help you transform your home or project. Why not create a seamless look and take your porcelain floor tiles outside? Our range of outdoor 20mm slab porcelain tiles are ideal for those who want to flow their interiors to their exterior areas so you can increase your living areas and create a fantastic outdoor entertaining space. Our range of porcelain outdoor tiles are frost resistant, extremely hardwearing and available in a great selection of colours and most of all brilliant value for money. Porcelain tiles are perfect for outdoor use as they are non-slip, easy to clean, weather resistant, do not change colour or deteriorate over time and resistant to heavy loads and traffic. Why are outdoor porcelain tiles becoming so popular? Unlike other materials such as wood, natural stone and cement, porcelain is not porous and therefore it does not absorb liquids. This means that it does not stain or crack and it does not require surface treatments or special maintenance. Due to the tiles lightweight properties and affordability, it's easy for DIYers to lay their own patio and use the same or similar tile design indoors to create one continuous look. If you want a truly authentic style then why not take a look at our selection of natural stone tiles that you can take outdoors. We have a contemporary natural black slate which had a wonderful textured surface and links perfectly with industrial design schemes. whereas sheera multicolour slate brings warmth and colour to your external areas and a bespoke style no other floor tile can match. 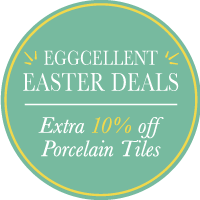 Why not take a look at our range today, you can start planning the perfect outdoor space in a few clicks - whether you're creating an exciting outdoor entertaining space or simply looking to revamp your garden patio, we are sure to have a tile for your area. Why not give us a call if you require any advise, we’re happy to help.